Having thoroughly enjoyed Rio by Doug Wildey Graphitti Designs Edition I was anxious to get my hands on all of Doug Wildey’s Rio material through IDW’s Doug Wildey’s Rio: The Complete Saga hardcover. 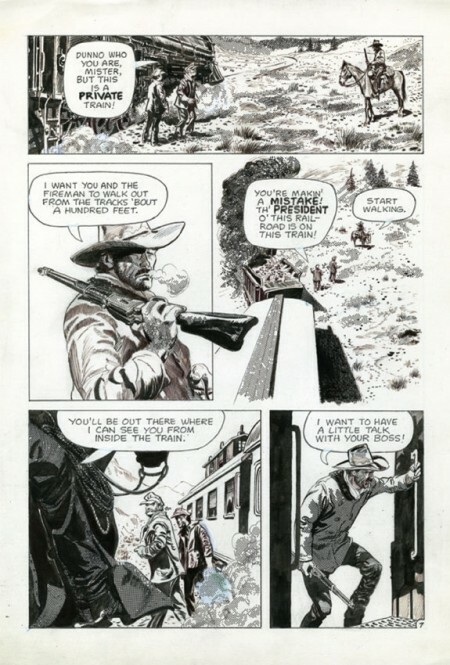 Doug Wildey was an acclaimed Comic book and comic strip artist, as well as a noted animator. Very much in the school of Milton Caniff and Alex Toth, Wildey was an artist’s artist, a storyteller of the highest order, and worked in many genres—westerns and war stories being some of his most memorable. As an animator he created and designed the groundbreaking Johnny Quest series in 1964, which inspired a generation of cartoonists with it’s memorable characters, thrilling, breakneck pace, and innovative designs. 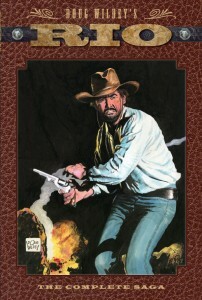 In 1987 Wildey began one of his most personal works, the story of an aging cowboy and gunfighter, as well as special agent for the President of the United States, Ulysses S. Grant. Wildey created stories full of human drama and historical accuracy rarely seem before or since in the comic book western. This volume collects the entire Rio saga in one handsome collection, including the final, unfinished and unpublished Rio story. This volume collects Wildey’s Rio published works from Eclipse/Comico (1987, Comico reprinting as one volume stories from Eclipse Monthly issues 1-10 1983-84), Marvel (1990) and Dark Horse (1992), plus two unpublished stories that were works in progress. Rio is about a former outlaw who received a presidential pardon and is now on the straight and narrow. A skilled gunfighter and cowboy, he knows the dark side and tries to live in his older years as a force of good; just not too good. It’s well written and a strong character driven story keeps the reader completely engaged. Mix in historical figures for authentic backgrounds and we’re treated to a solid western. Before we get any further it’s important to note that IDW has created this book from scans of Wildey’s original artwork, much like their take in Artist’s Editions. Since Wildey did everything himself, including colouring and lettering, most of this volume is in colour. Unfortunately the first story is a mixture of colour and black and white pages creating a lack of cohesion and flow. It feels like this was to be an Artist’s Edition but then the project was turned into something else. Thus Doug Wildey’s Rio: The Complete Saga becomes a special volume for Wildey fans and not a complete book of his work: don’t pick this up if you’ve heard good things about Rio and want to read everything available. You’re better off picking up the three softcover editions of the original material or at least the first volume, all cheap online, enjoining the completed coloured works, and then picking up this volume if you want to delve deeper into the material. Here’s a quote from “About This Edition” preface: this would have been infinitely helpful if any mention of it was included in the book’s solicitation information. With the exception of 10 story pages, all he images in this volume were scanned directly from Wildey’s original artwork. We have chosen to treat this collection as an art book, with only minor cosmetic cleanup, and have endeavored to reproduce Wildey’s originals as closed as possible to his art. There are two distinct art styles displayed, clearly dividing this volume in two. First we have the early Rio in the form of the 1983-84 Eclipse material: it’s finely detailed with a lot of pencil and ink work and then the limited colour palette of the day. Since less than half is coloured here we’re treated to the beautiful inked artwork; clear, defined, clean. 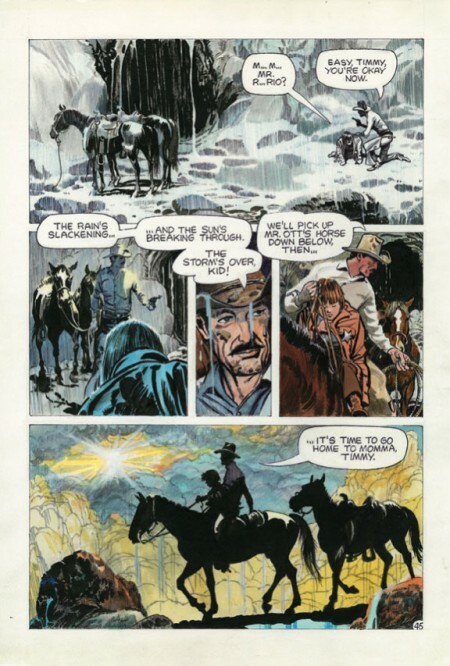 Following that we’re presented with the Marvel and Dark Horse material from 1990 onward, where Wildey relies on colour to flesh out and define the artwork. Gone is the linework and crosshatching, replaced with thicker inks and a strong colour palette; it’s gradual but hard to miss. For extras we have an introduction my Mark Evanier, a gallery of covers and model sheets and the uncompleted story Reprisal; it varies from breakdowns and pencil roughs to coloured pages and is better thought of as an extra. For Rio fans Doug Wildey’s Rio: The Complete Saga is a must have.